The FedEx for Salesforce app brings two of your favorite online services together; FedEx Shipping is natively integrated inside Salesforce CRM. The app integrates with all the order management and supply chain management apps like Kenandy, Accounting Seed, Conga Composer, Glovia, Ascent, Cloud Conversion, ChikPea, Veeva, Rootstock and FinancialForce. With Chatter, you can follow any shipment and get real-time updates on your Chatter feed. There are currently no reviews of FedEx for Salesforce. Zenkraft's FedEx for Salesforce app integrates with all versions of Salesforce: Group, Professional, Enterprise, Unlimited and Force.com. - Mail and ship to any lead, contact, opportunity, account or custom object with native FedEx shipping. - Quickly calculate FedEx shipping rates for comparison before instantly generating and printing FedEx shipping & return labels. There's no need to include an RMA label in the shipment. - Improve customer service by using 'Chatter' to stay "in-the-know". Receive real time tracking updates on any shipments that you follow. You'll never need to copy and paste long tracking numbers again. 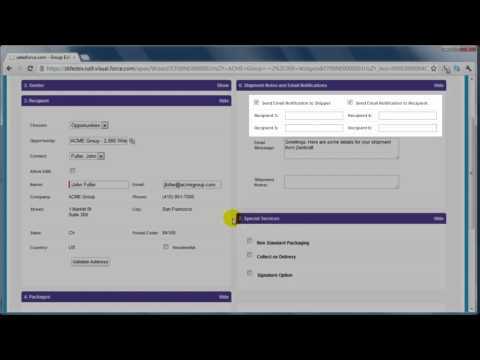 - Generate international forms with FedEx for Salesforce. Ship international outbound & returns within Salesforce by creating pro forma invoices, commercial invoices, certificate of origin and NAFTA certificate of origin forms, as templates. Save up to 15 minutes of form-filling per international shipment. Below are some frequently asked questions for FedEx for Salesforce. Q. What type of pricing plans does FedEx for Salesforce offer? Q. Who are the typical users of FedEx for Salesforce? Q. What languages does FedEx for Salesforce support? Q. Does FedEx for Salesforce support mobile devices? Q. Does FedEx for Salesforce offer an API? No, FedEx for Salesforce does not have an API available. Q. What other apps does FedEx for Salesforce integrate with? Q. What level of support does FedEx for Salesforce offer? Q. Which apps is FedEx for Salesforce compared to most often?